Sun beams glance off the gold leaf floating in the bubbles of my Laurent Perrier. The level in my glass never seems to diminish despite my diligent sipping. How much gold leaf can one safely ingest, I wonder? Reading my mind, an elegant lady in black appears at my side. “It’s good for you,” Ms La Prairie says. “We put it in our skin-care preparations, too…” Splendidly-presented caviar canapés materialize before me and several pop into my mouth. “Along with caviar,” says Sonja Glavas, marketing director of La Prairie Switzerland. “I’m intrigued. Tell me more,” I say to Sonja, whose skin is so radiant, it’s dazzling. “Our products are formulated with exclusively-patented Cellular Complex which effectively erases visible signs of skin ageing as they occur. In continuing to develop ground-breaking formulations, La Prairie uses the most precious, sumptuous ingredients like rich caviar, rare platinum and opulent gold,” she says. Half expecting to be offered slim slivers of platinum to nibble on next, I listen intently as Sonja delivers a polished presentation about the history and origins of La Prairie and the latest caviar technology, used for the first time in Skin Caviar Absolute Filler. I’m about to have this cream applied to my face so I’m riveted – especially concerning the lathering of fish eggs on my skin. I’ve always been dubious about how my sensitive skin and eyes will react to unusual ingredients but I reason that if one trusts the Swiss with precision surgical instruments, watches, and pharmaceuticals, I can trust the world’s premier Swiss-made skin-care range with my visage. Sonja tells me that to create the newest Skin Caviar product, La Prairie’s scientists use an advanced technological process that captures the most potent nutrients found in caviar. And as one would expect, La Prairie does not just use ordinary fish eggs – the caviar is extracted from the roe of Baerii sturgeon grown on aquaculture farms in France. The lady in black can’t tell me too much more as the precise ingredients and processes are strictly classified. La Prairie takes extreme measures to protect their formula. There are three separate labs to ensure the complex remains a secret – one lab for the yeast fermentation process, one for the micro-organism fermentation process, and a third in which the various components are blended together. No single technician or chemist knows the exact recipe. I also learn that Dr Paul Niehans, founder and head doctor at the Clinique La Prairie in Montreux when it opened in 1931, was summoned to Rome to the bedside of the dying Pope Pius XII in 1953. After receiving a course of the doctor’s ground-breaking cellular therapy, the Pope evidently recovered. In gratitude, he granted Dr Niehans membership to the Papal Academy of Sciences. Among other notables who have entrusted themselves to La Prairie are Charles de Gaulle, Emperor Hirohito, members of the British Royal Family, Sir Winston Churchill, Marlene Dietrich, Greta Garbo, Marilyn Monroe and Charlie Chaplin. It’s all part of the legend, the mystique, the allure of La Prairie which is exquisitely packaged using the famous La Prairie Clinic Montreux in Switzerland as a symbol. Before the bubbles get the better of me, Sonja escorts me to a sumptuous treatment room in the exclusive La Prairie boutique at the five-star luxury hotel Grand Resort Bad Ragaz, Europe’s leading wellbeing and medical health resort. 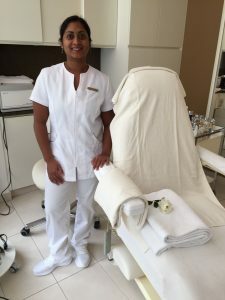 I’m placed in the expert hands of beauty technician Miriam who cleanses my skin, applies a peel formulated with mixed fruit acids, a tonerand, just before the moisturiser, the tour de force… the caviar serum. It feels voluptuously moisturising and I can feel the highly-concentrated caviar oils and proteins smoothing, plumping, and hydrating my skin. Between the various applications, Miriam gently massages my hands. The therapy is so relaxing and her touch so soothing, I drift away in a dream-like state, floating somewhere above the green meadows, church spires, and snowy peaks of Bad Ragaz. I depart an hour later walking on air in my white robe and matching slippers. My skin has a distinctive glow… just like Sonja’s. Careful not to splash my radiant visage, I slip into the historic 19th century Helena Pool at the Grand Resort Bad Ragaz whose fame and reputation date back to the discovery of Europe’s most abundant source of thermal waters in the nearby Tamina Gorge in the 13th century. A member of the Leading Spas of the World, the facilities at the 36.5° Wellbeing and Thermal Spa are among the most extensive in Europe and would take weeks to fully experience. I need a map to find my way around the 5,500 sq m spa. Depending on the season, guests can choose from the Helena, Kneipp, or the sports and garden pools and eight sources of wellbeing offering massage and beauty treatments as well as sport and fitness facilities. For spa connoisseurs, there’s a herbal steam bath decorated with Swarovski crystals while the extravagant 100 sq m private spa offers individual service and privacy. Guests have exclusive use of a sauna, steam bath, whirlpool bath, hydro-massage shower, loungers, a home cinema, treatment and dining area, and a garden terrace. The resort’s 7,300 sq m Tamina Therme spa complex, which is open to the public, encompasses indoor and outdoor pools, whirlpool recliner baths, a waterfall, and a counter-current channel. The Sauna Nera is a sensory feast combining the interplay of drama, light and music with infusion ceremonies featuring aromas, facial and exfoliation treatments. At the resort’s internationally-renowned Medical Health Centre, guests can consult more than 70 doctors and therapists in the specialised fields of rheumatology, orthopaedics, rehabilitation, mental health, dermatology, aesthetic and plastic surgery, dentistry and implantology, gynaecology and fertility, ophthalmology, complementary medicine, and an inpatient clinic for musculoskeletal and oncological rehabilitation… all under one roof. For further details about The Grand Resort, Bad Ragaz, visit their website at www.resortragaz.ch/en.html. For more about La Prairie, visit www.laprairieswitzerland.com. Contributing Editor Justine Tyerman is an award-winning travel writer, journalist and sub-editor from Gisborne, New Zealand, with 20 years’ experience in newspaper and freelance work. Check out her work at www.just-write.co.nz and Tyerman’s Travels Facebook. Justine travelled courtesy of Switzerland Tourism and stayed at the Grand Resort, Bad Ragaz. 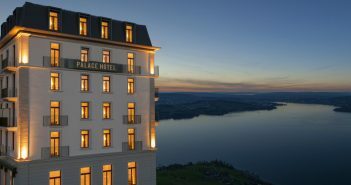 LUXURYSWITZERLAND.COM is part of the LuxuryGlobe group of websites which focus on pure enjoyment and exquisite pleasure from around the globe. As we roll out our series of country-related websites users will be able to fast track to the country or city of their choice. Privacy & Terms © Copyright 2016-2018 LuxuryGlobe. All rights reserved.